Coming to The Gallery at KCA on Saturday, April 13, 2019 at 7:00pm. Tickets are $15 and available on this website, at The Gallery at KCA, 208 E. Beale Street or at the door. We are excited to bring these talented performers to Kingman! Music Reporter, the Top 100 chart for New Age, Ambient, and World music. haunting, beautifully enchanting, and uniquely memorable sound. Green Valley Performing Arts Center, The Listening Room, Tlaquepaque in Sedona, and more. radio stations around the globe. 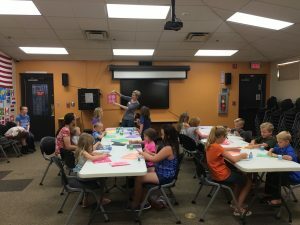 This summer, the Kingman Center for the Arts in association with the Beale Street Theater and other local arts organizations, implemented a popular and successful children’s arts program. The Kingman Center for the Arts held classes for children of all ages to explore the arts in areas such as painting, weaving, music appreciation, and theater. The classes were all well attended; the theater class was so popular it was split into classes for multiple age groups which are each working hard on their own performance pieces. 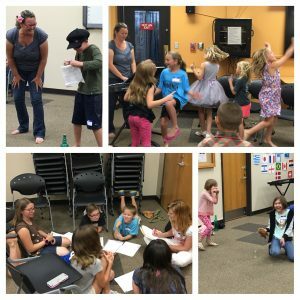 The children’s community theater class is practicing for their upcoming performances. One of which is original play, Dreamland, written by Kingman local Jean Chowan. The performance will be the opening act of the Arts in the Park Bazaar, which will be held at Metcalfe Park on August 6th from 5-10 p.m. 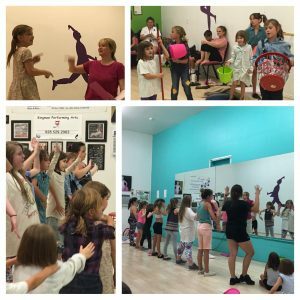 The Children Community Theater group has also teamed up with a local performing arts school, Kingman Performing Arts, for an Annie medley that will be performed the same night. Thank you to everyone who came out to support us. We look forward to future events and classes with the community of Kingman! Kingman has talent and has come together to kickoff the fundraising effort to renovate the Beale Street Theater. It was held in the old Elks building located at Fourth and Oak Street in downtown Kingman. The building was donated for our use by owner Scott Dunton. He has been a great supporter of our effort. The evening started with Marilyn Moser playing in the courtyard as supporters entered. She was followed by Black Lemon. Upon entering the building, attendees were treated to an amazing art display, organized by our dedicated volunteers to showcase local artists. Refreshments, donated by local businesses and our volunteers were served in the bar area. A silent auction was also available to patrons in the same area. We received a number of donations from businesses and local artists that helped raise funds during the evening. The main gallery showcased talent from across our community. We were excited to have so many performing artists share their abilities. They filled up a full three hours of entertainment. It was a wonderful evening. Please give a big THANK YOU to our sponsors who helped us pull of a very successful event. The talent line up for the night was incredible. Besides the performances happening inside we had music outside in the courtyard including Music by Black Lemon and Marilyn Moser. Hopefully you didn’t miss the strolling entertainment Jim Murawski our Andy Devine Impersonator, Darla Watson our Mae West Impersonator, Royce Williams the Gospel Magician and The High Desert Drifters our Old West Cowboys.